Kuala Lumpur is the capital city of Malaysia and also the largest city in Malaysia. I been to this city for few times but 3 days is the longest stay, not because nothing to see, but mostly I come here just for transit or for weekend trip only. Here are things you should do if you only have 2 – 3 days in Malaysia. KL Tower is a must-see landmark at Kuala Lumpur, you can enjoy the view of KL city from the observation deck at 276m or from the open Deck, the Sky Deck at 300m above the ground level. The best time to visit is in afternoon, sunset view. There are a lot of entertainment you can find in this tower, like shopping mall, aquarium, F1 simulation, restaurant and many more. If you have more budget you might consider to have dinner at the revolving Atmosphere restaurant at 282m above the ground level, find out the price and reserve you table on their website. Or you can try the sky box on sky deck, the KL city view is just under your feet. If you are up to something more extreme, there is a base jump, participant have to jump into the air from the sky deck but this is only available when KL Tower International Jump Malaysia (KLTIJM) is held in annual event. Check the updated price and current event at KL Tower website. How to get here : Take the train to Masjid Jamek or Dang Wangi or monorail to Raja Chulan or Bukit Nanas then continue walk for about 7-10 minutes. It is also walkable from KLCC. Been here for few times but never manage to go to the observation deck, sometime just sitting at tower surrounding park or just taking some pictures of this tower is enough. 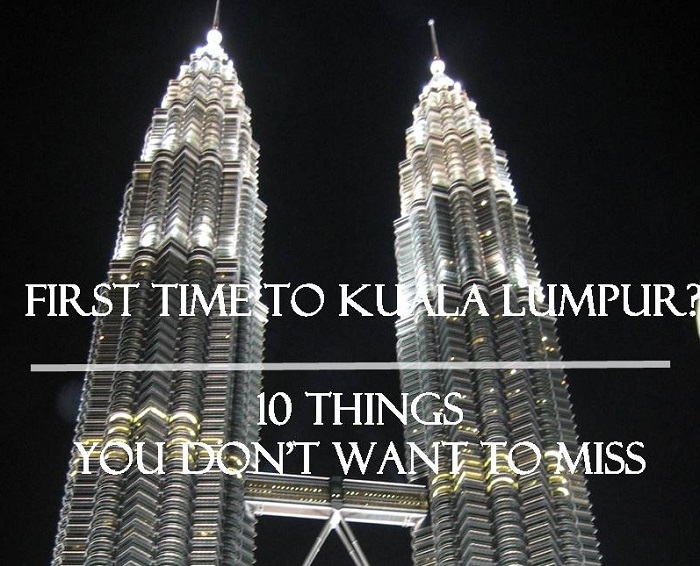 But sure, you don’t want to miss this landmark when you visiting Kuala Lumpur. If you decide to go up and want to avoid a long queue, book in advance. I prefer to come here at night as the towers are lit with hundreds of lights and the water fountain in front of the towers also has a different colour, beautiful. How to get here : Take LRT to KLCC Station, it is just next to it. Or if you are at Bukit Bintang area, just walk. It is a cave temples located in a limestone hill, guarded by huge Lord Murugan Statue, be prepared to walk 272 stairs up to the cave. Be careful with a not very-friendly-monkey living inside the cave, don’t bring any food or a plastic bag looks like a food bag. How to get there: The most convenient way is take the komuter train to Batu Caves from KL central. You can take bus too from Titiwangsa, alight at the bus stop near batu caves. Masjid Jamek is one of the oldest mosque in Malaysia, built in the year of 1907. The architecture of the mosque is a combination of Moorish, Islam and Magul. The design of this mosque is beautiful, it combines of different culture. How to get here : Take the KL-Monorail to Hang Tuah Station, then transfer to the Star LRT then you will reach the Masjid Jamek Station. This place is famous for an imitated designer goods, you can find many things here like wallet, t’shirt, bag, watches and many more. If you want to shop here, don’t forget to BARGAIN, they tend to mark the price up. You can find many nice food stall here too, mostly Chinese food so if you don’eat pork, please make sure with the seller. How to get here: The nearest train station is Pasar Seni Station, from this station just walk to Chinatown. Bukit Bintang is known as backpacker area, a lot of cheap and nice hostel around. It is home for many shopping centres, café, nightlife and also hawker-type eateries. The famous hawker food row is jalan Alor or if you fancy for middle eastern food, go to Ain Arabia or Arab Street. How to get here: From KL Central, take a monorail and stop at Bukit Bintang Station. I believe you already have an idea about this place, don’t you? You are correct, it is named Little India due to its high percentage of Indian businesses as well as residents. You can find sarees, glass bangles and also food here. How to get here : You can either take the Putra LRT and stop at KL Sentral or take the KL monorail and then stop at KL Sentral. The main temple hall is beautifully decorated by dragon-inspired columns and immaculate roof-top, you will be able to enjoy the breath-taking view of the Kuala Lumpur Skyline. The best time to visit is during Chinese New Year, crowded but you don’t want to miss the activities. It is situated on top of the Robson Hill, the journey up to the top of the hill is rather steep. How to get here: From the KL Central, take KTM and stop at Mid Valley Station then continue with cab to Thean Hou Temple. This Pink Mosque also known as Putra Jaya Mosque located at Putra Square along with some interesting building surrounding by Putrajaya lake. This mosque constructed with rose-tinted granite, look different with others mosque. Tourist is not allowed to get inside on prayer’s time unless you are muslim. Wear a proper clothes if you have plan to visit this mosque. How to get here : 1) Take a KL transit train from KL sentral to Putrajaya (25 minutes, cost MYR 9.50), then from Putrajaya station take a cab (MYR 11.50) or bus no 100, 200 ,500 (MYR 0.50) to Pink Mosque (Putra Mosque) or Putra Square. 2) take a bus from Pasar Seni LRT station in Kuala Lumpur to Putra Jaya terminal (MYR 3.50), then take a cab or bus no 100 ,200 ,500 to Putra Square. Experience South East Asia’s longest and fastest cable car to Genting Highlands , the legal land-based casinos. Apart from the casinos, there are others entertainment available in this area, such as amusement park and also snow world. It is about 2000m above sea level, the weather is cold so remember to wear warm clothing especially in the evening. You can find cheap accommodation here, in the apartment next to the hotel, just walk around.